New Delhi (Agenzia Fides) - It is urgent to alleviate the devastation and rescue the victims affected by the violent floods registered in the Indian states of Kerala and Karnataka in recent months and also in Tamil Nadu a few days ago: with this spirit the Pontifical Mission Societies (PMS) appeal to all people of good will, and launch an emergency fundraiser. The President of the PMS, Archbishop Giampietro Dal Toso, in an open letter, explains to the entire international network of the PMS that this was the worst natural disaster of the century in this region. On receiving data and detailed information from the National Directorate of the PMS in India, Mgr. Dal Toso launched an appeal "to contribute to the PMS emergency Fund, so that we can provide the necessary help to repair and reconstruct the ecclesiastical structures for the Christian faithful of India". 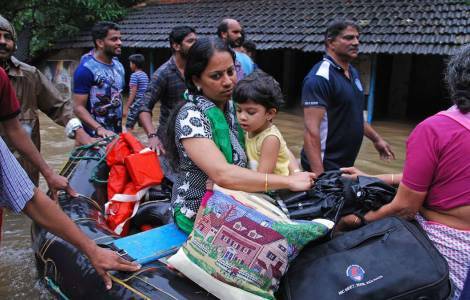 The floods in Kerala last August caused over 1.5 million homeless people, causing the estimated damage of at least 2.8 million dollars. Over 57,000 hectares of agricultural land have been flooded, 11,000 homes destroyed and 26,000 houses badly damaged. The Church responded by organizing over 4,000 camps to host refugees and mobilized over 100,000 volunteers. Many churches, shelters, Catholic institutions, dispensaries have been destroyed. Over the past 50 years, the Pontifical Mission Societies have supported the dioceses of Kerala and Karnataka by offering a stable support for evangelization, as well as funding several thousand projects.